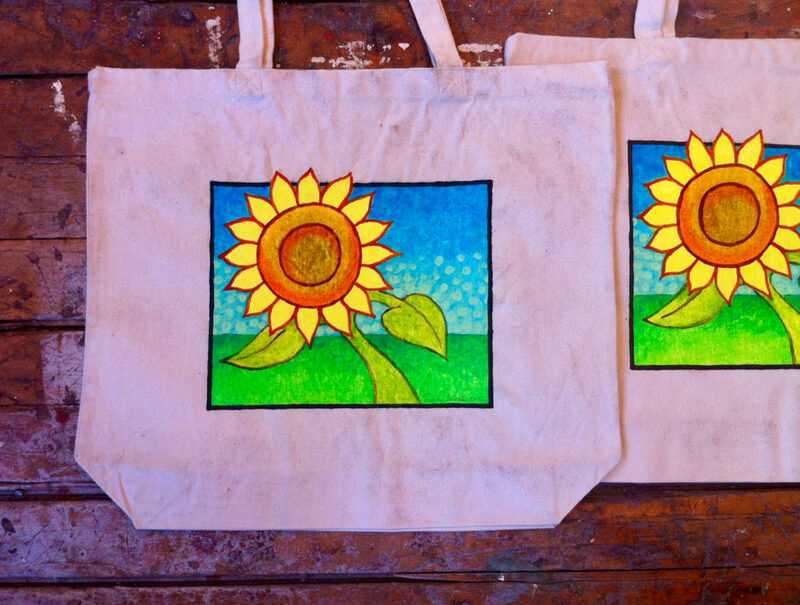 A few years ago I set about to make a series of hand-painted canvas tote bags. I ordered a couple dozen plain canvas bags online. I drew up a simple, happy, graphic image that seemed like it would be easy to reproduce. I cut out a paper stencil so that I could transfer the drawing consistently from bag to bag. I cleared all the flat surfaces in my studio. Then I got busy making the acrylic paintings. My original intention had been to put these on Etsy, sell a bunch of them, and fund my next art project. But they languished in my Etsy shop, and I never sold a single one. I ended up giving most of the bags away to friends and family members, and of course I’ve kept a couple for my own use. I may have one or two left; if you want one, please get in touch. The photo gallery below shows the process I devised to make the paintings. Instead of painting each bag’s image from start to finish, I used the mass-production approach: I performed each step on all of the bags before proceeding to the next step. So for example, first I painted a rectangle of white primer (gesso) onto each of the bags and let it dry. Then I stenciled my sketch onto each of the bags. Then I painted the blue sky onto each of the bags. And so on. The later detail steps were a bit more improvisational, so there are minor differences among the paintings that hopefully add some character.